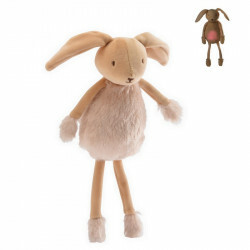 These light-up soft toys shine in the dark to comfort babies when time comes to calm down or sleep. The lovely Marie, great singer and hero from the Disney movie The Aristocats, guides baby to sleep.With 2 options, this very soft toy spreads either a delicate light or both light and sweet lullaby. Kids favorite hero from Disney's master piece Lion King, Baby Simba becomes their best friend with this very soft light-up toy ; its delicate light varies with rainbow colors and comfort them when time comes to sleep. Here is Chouka the Panda, a super soft light-up plush to send baby to sleep. Perfect for little ones from birth. 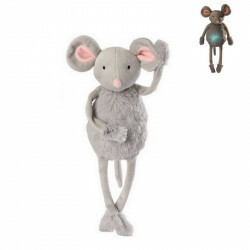 The mouse Noémie is a light-up and musical soft toy. Its delicate light shines with the 7 colors of the rainbow and for the first time, this light-up soft toy is machine washable! Simeon the Sheep is the first luminous and musical sheep that is machine washable. Just like his friends, Simeon lights up with the colors of the rainbow and can also turn into a musical soft toy with its soft lullaby . This cloud-shaped cushion lights-up with sweet rainbow colors. It soothes and comforts baby when comes the time to sleep.